Sun entered Pisces February 18th, 2019 and shortly after a full moon in Virgo at 7:53 am PST. When I awoke this morning, I knew the moon would become exact in fullness before I meant to sit down and write about it, but it was in the back of my mind for sure as I read a few headlines this morning as I waited for my tea to help with my sleepy eyes to become awake. First news story that caught my attention was the death of Karl Lagerfeld the fashion icon, which prompted me to want to look at his chart (not sure if we have an exact birth time on him) and the second was that Bernie Sanders announced the launch of his campaign for President in 2020. The Sun entering Pisces yesterday at 3:04 pm PST also brought a shift from Aquarian mental fix energy into a softer imaginative emotional place of Pisces. Another significant shift yesterday was Chiron shifting into Aries again now to stay until early 2027. The first ingress of Chiron into Aries was April 17, 2018, though it shifted retrograde on July 5, 2018 and moved back into Pisces September 25, 2018. Chiron will now steadily move through Aries over the next 9 years before entering Taurus in 2018. The last time Chiron was in Aries was 1968 through 1977, with a short re-visit into Pisces in late 1968 early 1969 as well . Anyone born during these years will now be experiencing their Chiron return. The Chiron return is a period of remembering our original wound and how far we’ve come in our healing this piece of our inner world and then how we radiate our fullest expression of who we are and our significant gift to humanity from that shift. First let’s explore the news stories from this morning and then dive into the broader astrological themes from Sun in Pisces, full moon in Virgo and Chiron in Aries. Bernie Sanders announcing his campaign for the Presidential election in 2020 this morning seemed a bit like divine timing, or maybe he has a secret astrologer. One might imagine that with Sun in Pisces. Whether Bernie has his own inside scoop from a cosmic coach, his announcement today is rather interesting for a few reasons. First it is a full moon in Virgo. Virgo archetype is about humility and service, there is no other politician of his generation I’ve seen with this framed in his character more than he has. Additionally, Bernie’s also a Virgo sun, born September 8, 1941 in Brooklyn, NY. We do not have an exact birthtime, but we have place and day of birth so we either do a 12:00 PM EST chart or a sunrise chart to get some information on his nativity. https://mountainastrologer.com/tma/bernie/ This article in The Mountain Astrologer also is good from when he ran in the 2016 elections. Bernie has Sun, Lunar North Node and Neptune in Virgo. Mercury (ruler of Virgo) is in Libra, one who seeks to social justice, fairness and balance through his communications and exchange of ideas. Bernie’s Venus is also in Libra, making his Mercury that much stronger with the ruler in her own sign. Perhaps he makes it in his bid this time round, too early to say but it would be a mistake to consider him an underdog this time. However, there will be many we will be seeing join the campaign trail and slowly they will fall away as we near the election in November 2020 which is many moons away from this moment. We do not know his Ascendant or any of the angles of his chart, nor the exact sign of his moon without a proper birth time so we really cannot speak to how his announcement today is divinely timed or not relative to his nativity, but it sure FEELS like it was timed to the full moon moment for his announcement, and sometimes the more powerful things are felt rather than factually known. How Piscean a notion! The Sun’s ingress into Pisces has a significant amount of magical, mystical or escapism energies with it. Why? The modern ruler of Pisces is Neptune. Neptune is also in Pisces at 15 degrees 35 minutes at the moment of the sun’s entry to Pisces. Also, Mercury is just a degree past Neptune in Pisces at 16 degrees 41 minutes. Our thinking with Mercury in Pisces is more imaginative and I would even say really spaced far out with this close conjunction with Neptune. It may be very hard to focus or finish sentences until Mercury is a good distance away from Neptune. It will be easier to binge or lose track of time while creatively expressing yourself. By the end of February, you may feel the fog begin to lift. Meanwhile, paint, draw, ponder music, play with watercolors or take jaw dropping photos – all great ways to play with this nebulous watery flow. Jupiter is the traditional ruler of Pisces and should absolutely be considered for how lines up with this Sun, Neptune and Mercury in Pisces. Jupiter is at 20 degrees 43 minutes Sagittarius, its own domicile. Jupiter is square to the Mercury and Neptune conjunction in the ingress chart for the Sun in Pisces. There are few ideas that come to mind on the challenge of the square in the mutable signs. Issues of borders of course, but what else? Foreign relations (Sagittarius) and higher education, long distance travelers or airlines may have challenges with misinformation or scandal. The news on religious organizations will be more noticeable and often with less than favorable views of events coming into light at the full moon. There may be noticeable tension of polarities even greater during this month as well. Pisces is also sextile to Capricorn where we have another line-up of planets. Reading his words and then considering the illusive nature of the present moment it strikes a chord for balance that is required for both energies expression right now. I keep thinking of maturity and right timing seems right for Venus in Capricorn. When we say or do something does have importance in the way the wave trickles out to others in our lives. Have you ever paused a heated argument knowing the timing was not fruitful for a meaningful exchange and delayed the talk with someone to be more centered to really be present and willing to be vulnerable but commit to working on whatever the issue was that created the heated argument? That’s maturity, that’s healthy management of self. Venus in Capricorn, especially with Saturn in Capricorn is committed to relationship, hard work included. The full moon in Virgo is a handle of a bucket to the rest of the planets in the chart. It is a powerful moon from that perspective especially the pronounced Virgo focus service and selfless care it emphasizes in this moment. It also is in a trine with Mars in Taurus at 3 degrees 31 minutes and in an earth sign like Saturn, Venus and Pluto giving energy in life on earthly matters (food, body, self-confidence, passion, responsibilities, duty, hard work). Routine will help us with mental fog and attending to our health and well-being. Having such a dynamic Virgo full moon with three planets in Pisces I cannot help but think of the master many of us know as the Christ, Jesus within the Pisces and Virgo polarity. 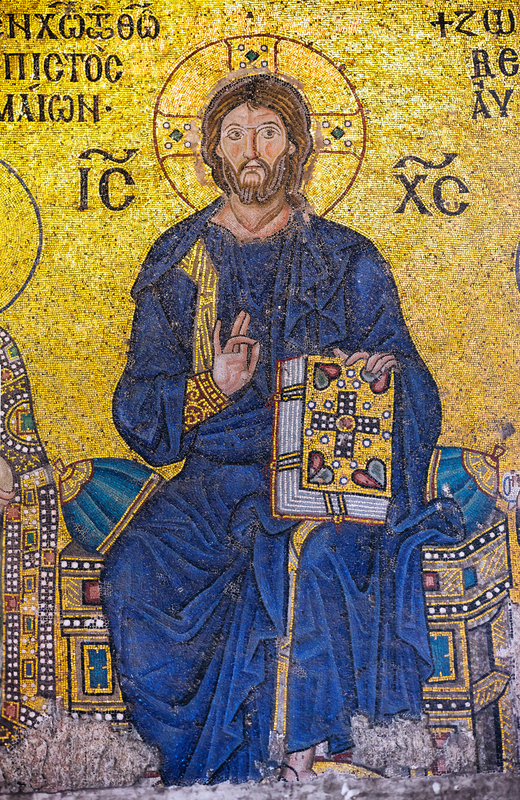 I have often pondered the images of Jesus in mosaics and painting with his hands gestures, which are similar to the multitude of hand mudras in statues and art for the Buddha I’ve seen. Have you ever pondered why both (and other masters replicated in art) are made with these hand gestures? I cannot help wonder if there is a tie between the two. I think about the teachings of Christ frequently, and I do my best to shed the dogma, though that takes time, the wisdom within his teachings are truly inspiring and sacred. I have a book I bought several years ago during my spiritual crisis of my divorce in 2011-2012. The book is called The Common Teaching of Four Mystical Traditions: Jesus, Buddha, Krishna, Lao Tzu – The Parallel Sayings edited by Richard Hooper. I have enjoyed many quiet moments reading this book exploring the wisdom of each of these masters. I’ll leave you with this one from page 74 from the Gospel of Thomas.